The collapse in margin has been sudden, but is hardly unexpected. It is, of course, true that downstream polyethylene plants associated with the crackers were delayed by the hurricanes. 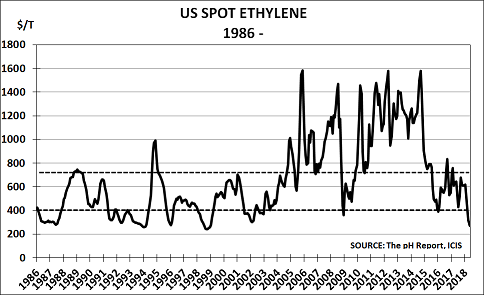 So ethylene prices may recover a little once they come online. But unfortunately, that is likely to simply transfer the problem downstream to the polymer markets. The problem, of course, was that companies and investors were fooled by the central bank stimulus programmes. They told everyone that demographics didn’t matter, and that they could always create demand via a mix of money-printing and tax cuts. But this was all wishful thinking, as we described here in the major 2016 Study, ‘Demand – the New Direction for Profit‘, and in articles dating back to March 2014. Unfortunately, the problems have multiplied since then. President Trump’s seeming desire to launch a trade war with China has led to the threat of retaliation via a 25% tariff on US PE imports. And growing global concern over the damage caused by waste plastics means that recycled plastic is likely to become the growth feedstock for the future. In addition, of course, today’s high oil price is almost certainly now causing demand destruction down the value chains – just as it has always done before at current price levels. People only have so much money to spend. If gasoline and heating costs rise, they have less to spend on the more discretionary items that drive polymer demand. 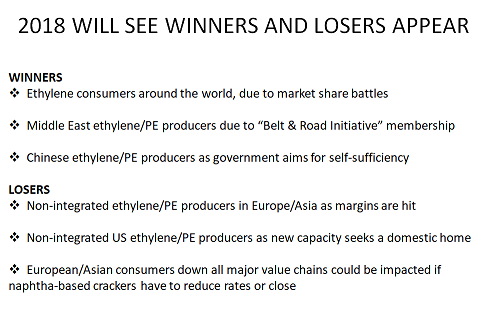 The Losers will likely be the non-integrated producers who cannot roll-through margins from the well-head or refinery. They need to quickly find a new basis for competition. Time, however, is not on their side. As US ethylene prices confirm, the market is already reacting to the reality of over-capacity. H2 will likely be difficult under almost any circumstances. The industry made excellent profits in recent years. It is now time for forward thinking producers – integrated and non-integrated – to reinvest these, and quickly reinvent the business to build new revenue and profit streams for the future. 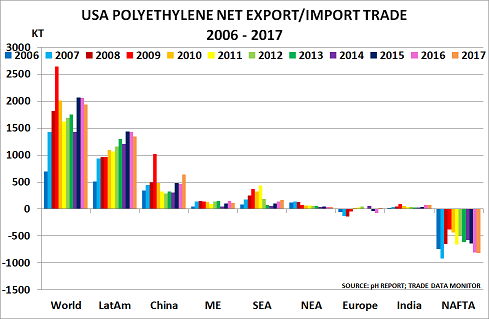 The post US ethylene prices near all-time lows as over-capacity arrives appeared first on Chemicals & The Economy. 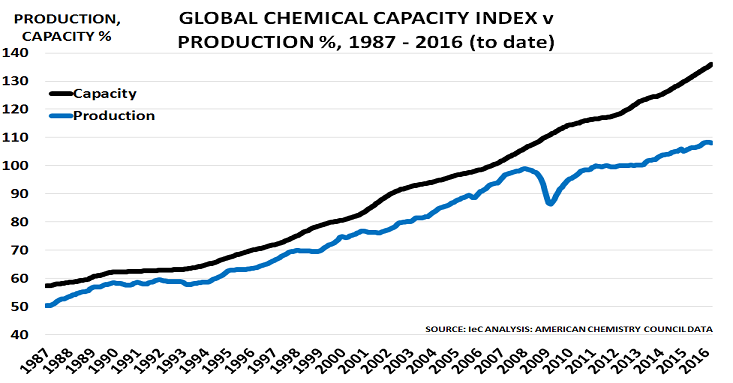 Global demand is continuing to slow, yet chemical industry capacity is continuing to ramp up. As a result, supply gluts are likely to appear in many key areas as we move into the second half of the year. 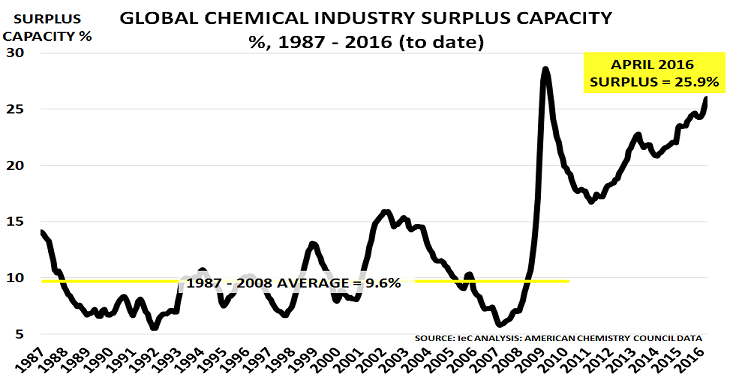 That is the key conclusion from the latest American Chemistry Council data for global chemical capacity and production. Oil prices have risen around 87% since mid-January, when Brent bottomed at $27/bbl. So there has been an enormous incentive for buyers to build inventory. But this rise has not been due to any shortages – inventories are in fact at near-record levels. Instead, it has been due to pension/hedge fund speculation over the outlook for US interest rates and hence the value of the US$. In turn, buyers will then likely start to destock into the seasonally weak Q3 period, as oil and commodity prices fall. Prudent companies urgently need to develop plans to mitigate the impact of this reversal. But this will not be easy – as the second chart shows, surplus capacity was already at 25.9% in April – more than twice the average 9.6% level seen in the SuperCycle. These developments mirror those seen for commodities such as oil and metals, and for polymers, during the stimulus bubble. The problem was that then-President Hu and Premier Wen panicked at the start of the financial crisis in 2008, due to the job losses being caused in China’s export factories. Fearing major social unrest, which could lead to the end of communist party rule, they doubled lending to $20tn in 2009 – 4x China’s GDP of $5tn. And they kept their foot on the accelerator till they left office in 2013, by when annual lending had reached $28tn. Temporarily, China’s demand appeared to rescue the global economy. And at the same time, the story spread that this was due to a previously hidden secret – that China had somehow become “middle class” by Western standards, without anyone really noticing. In reality, of course, average incomes were still only $5k/year in 2015. But no country, not even China, can continue lending at such a rate. Its interest bill in 2015 was $1.7tn – almost equal to India’s GDP. And not only was much of the money wasted in building ghost cities and property speculation, but it also boosted corruption and pollution. Such a vast lending bubble created easy pickings for corrupt officials. And pollution rose to intolerable levels, as 2/3rds of China’s electricity production is based on coal. Thus Hu and Wen’s 2008 panic ended-up by 2013 in creating an existential threat to continued party rule, as ordinary Chinese suffered the after-effects of the stimulus policy on a daily basis. The story of China’s electricity consumption boom, and its recent collapse, will be a case study for future historians on the chaotic conditions created by the stimulus policies. For us, living today, it creates a more immediate issue – namely how to manage the supply gluts that they have created. Business models will have to change as a result, as they are creating a paradigm shift in the global economy. Today’s supply-driven business models, based on the “build it, and they will come” principle, will have to be replaced by a new model focused on securing customer commitments to buy. The red line in the above chart from the Financial Times shows how far Eurozone growth has diverged since 2008 from the previous SuperCycle trend (in blue). Unfortunately, most companies failed to spot what might happen as a result of Europe’s ageing population. Instead they spent $bns on new capacity in anticipation of a strong economic recovery. Only now are they beginning to realise how expensive their mistake could prove. It is, of course, not true that ‘everyone else’s view on growth’ was similar to his. Sadly, like too many CEOs, he believed the hype from policymakers and the central banks. A quick read of the first chapters of Boom, Gloom and the New Normal (which began publication in May 2011) might have provided food for thought about alternative views on the outlook for growth. The chart also highlights how Eurozone GDP is now 15% below its trend-line growth (dotted red line). Just as first discussed back in December 2008, we have seen an L-shaped recovery. Equally, former US economic chief Larry Summers has now followed the blog in suggesting that “Quantitative Easing (QE) in my view is less efficacious for the real economy than most people suppose”. Friday’s news that JP Morgan will exit its physical commodity business is thus an important step in the right direction. It will hopefully soon be followed by the other major players. But policymakers have still not yet taken the critical step, which is to ask why their policies have failed so badly? They cannot yet bring themselves to recognise the simple truth that demographics drive demand. They still want to claim credit for the 1983-2007 economic SuperCycle, rather than accepting it was mainly due to the vastly increased numbers of Western BabyBoomers arriving in the 25 – 54 Wealth Creating age group. Lower growth is now inevitable in the West as a result of these ageing Boomers reaching their low-spending and low income years. Whilst China’s one child policy since 1978 means its growth is also slowing, as its population ages. “We expect the development of the second half to be rather flat compared to the first half of 2013. Achieving our earnings target is significantly more challenging today than we had expected at the beginning of the year”. Brent crude oil, blue, down 3%. Last April, China’s polyester market provided an early warning signal that the current downturn was about to start. Now, it is flagging an important change in relative positions within the value chain. This, of course, is very bad news for those who have invested in PTA and PET. They are suffering value leakage in relation to paraxylene (PX) prices, rather than adding value. The jump in Asian capacity repeats the pattern seen in the early 2000s, when China first boosted PTA production. Fellow-blogger Malini Hariharan noted last month that nearly 11.5MT of new capacity is expected in Asia this year, whilst only 1.4MT of new PX supply is scheduled. Major shortages, and considerable market disruption, could therefore occur if the new plants all bid for the same few available feedstock parcels. This wouldn’t happen in the West, where issues of profitability would take priority. Producers would instead optimise margins by selling PX and covering their PTA commitments by purchases. But China’s philosophy is not so profit-oriented. Instead, due to the often close linkages between companies and government, the need to maximise employment can have priority. This is especially true in a year when major politburo elections are underway, and the need for social stability is strong.